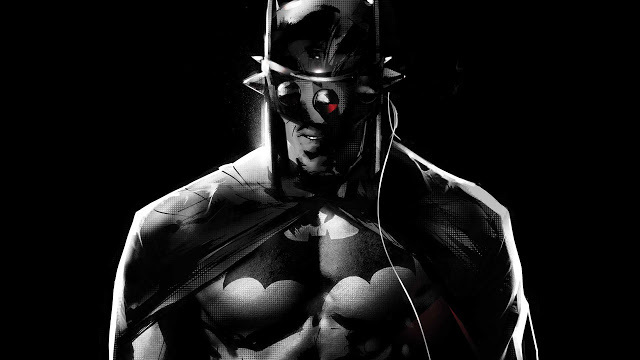 The Batman Who Laughs mini-series has been the most enjoyable Batman title on the shelf since issue one, and this coming from a guy who enjoyed Metal, however, wasn't quite ready to continue with the characters that title spawned. The way this story hits its twists and turns has provided me with some of my biggest genuine Batman shocks since Snyder's work on the Court of the Owls arcs. Needless to say, I'm pumped to continue the series this month and see how this all plays out after the cliffhangers to issue three especially. So without further ado ... let's discuss. The issue begins by resuming the huge cliffhanger from issue three, where we see Batman making the "Who Laughs" mask, as the anti-toxin lays broken at his feet. 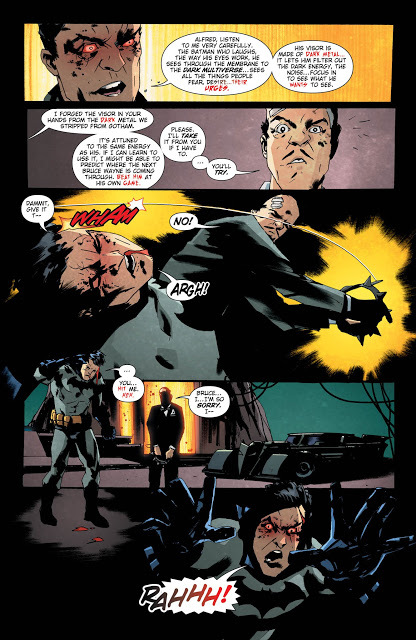 Batman tries to keep focus by centering his thoughts on the Robins, however, the results prove to be a mixed bag as his dialogue remains a mixture of both Batmen, while a conversation with Alfred ventures from calm to ugly in mere moments. 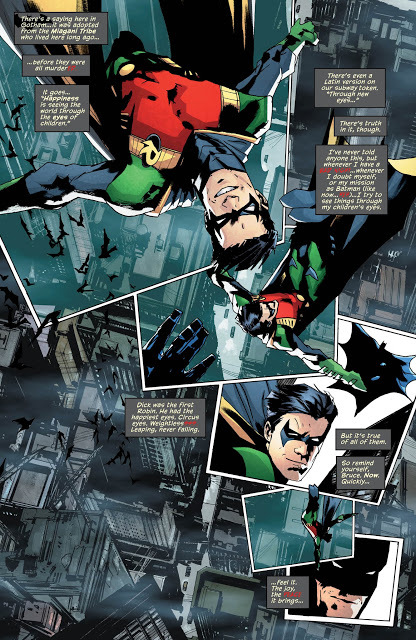 Both the art and dialogue do an excellent job of reflecting the change in Bruce/Batman throughout the issue, making a very confusing concept to pull off, in most situations, into something executed near perfection. 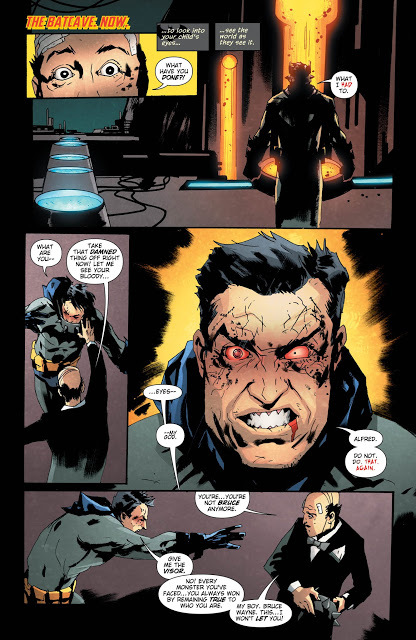 Bruce hits the town trying to continue and bring a resolution to this madness, that is right after explaining to Alfred (and the audience) a huge question most people have had for a while now; just exactly how does the Batman Who Laughs see what the hell is going on? I won't spoil all that in my review, but its a well thought out explanation I can roll with, that also comes into play in a huge way for this issue, adding to the twists and turns. The pace of the issue begins to really roll forward at this point as we jump around to a few different locations, reminding all of us who the different pieces in this chess match are in play. The one wild card in this story to me still is James Jr., who I can't quite figure out at this point yet. I think that is the purpose for him at this point, with his role is yet to fully be revealed, but there are hints he's finally also "seeing the light", and I'm not sure who that will benefit. From there the issue eventually starts to wind down to a wild conclusion, with the first stop involving Batman and the Joker reuniting to straighten a few things out with each other. Its a scene I think some people will love, and some will hate, and it all depends on how you view the Batman and Joker relationship penned by Snyder. As a fan of his work up to this point, I found it to be a great exchange that almost serves as an end cap to what the writer has to say about the relationship, involving Batman and Joker. This is really the moment of the issue that steals the spotlight for me and if it ended here I wouldn't have had many complaints. For a brief moment, it provides some clarity and shared ground the two rarely find, albeit over a very twisted idea, and it just works for me. We get a great set piece for the finale, taking place in a wing of Blackgate Prison, which holds a deposit of dark metal. Once again everything we thought this issue was leading up to gets turned on its head once again and just when you think Batman, despite all the handicaps he's been riddled with by his foes, is about to make some progress, we continue to see his nightmares are far from over as we're left with another cliffhanger wondering where do we go from here. It's one of those comic books that makes you want the next issue now, which is how I wish I felt after I finished reading more comics, but doesn't always happen as much as you'd like if you get my drift. Overall, the Batman Who Laughs continues to be the best Batman book on the 'spinner racks' right now, serving up a thrillingly haunting story that keeps you guessing at every page turn. The story atmosphere through dialogue, in combination with the art, do a great job of sucking you into the moment, really giving the reveals and surprises, that extra bit more of a haunting feel. Sometimes taking Batman out of his action centered stories and into new territory works. The Batman Who Laughs title, with a heavy horror feel, is definitely one of those times. The only negative I really had with anything this month is when we hop locations, via an inter-dimensional portal in the later parts of this issue. The location jump is very jarring in the moment because the only hints are really through text and very subtle changes. It takes a couple panels to get your bearings back under you to figure out what happened and was shocking enough reading through the first time, that the tone and atmosphere I was getting pulled into hit a momentary stop there. Upon further readings, its a much smoother transition, when you expect it coming. 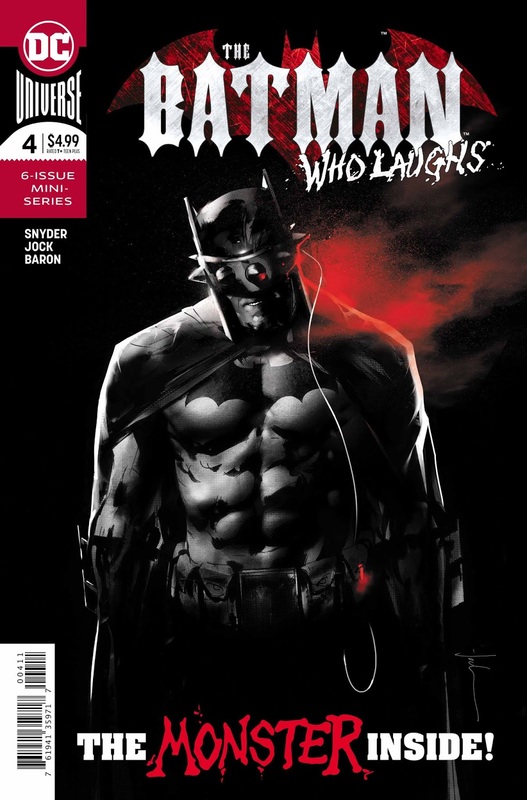 As a whole, the Batman Who Laughs continues to be the best Batman book on the 'spinner racks' right now, serving up thrillingly haunting story which keeps you guessing at every page turn. Even if the connections to Metal might have made you hesitate to pick this up at first, the title is making an argument that its entering must read territory, and it deserves such attention for the ways storytelling and art are working in conjunction to tell a truly one of a kind Batman tale.